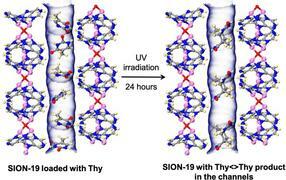 SION-19, a biologically derived MOF based on adenine was used to 'lock' Thymine (Thy) molecules in the channels through hydrogen bonding interactions between adenine and thymine. Upon irradiation, thymine molecules were dimerized into di-thymine (Thy<>Thy). The field of materials science has become abuzz with "metal-organic frameworks" (MOFs), versatile compounds made up of metal ions connected to organic ligands, thus forming one-, two-, or three-dimensional structures. There is now an ever-growing list of applications for MOF, including separating petrochemicals, detoxing water from heavy metals and fluoride anions, and getting hydrogen or even gold out of it. Now, a team of chemical engineers at EPFL Valais Wallis have synthesized a new biologically-derived MOF that can be used as a "nanoreactor" - a place where tiny, otherwise-inaccessible reactions can take place. Led by Kyriakos Stylianou, scientists from the labs of Berend Smit and Lyndon Emsley constructed and analyzed the new MOF with adenine molecules - one of the four nucleobases that make up DNA and RNA. "The adenine molecules act as structure-directing agents and 'lock' thymine molecules in specific positions within the cavities of our MOF," says Kyriakos Stylianou. 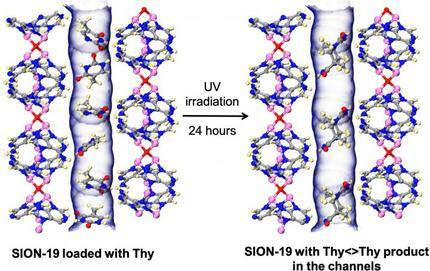 So the researchers took advantage of this locking and illuminated the thymine-loaded MOF - a way to catalyze a chemical reaction.